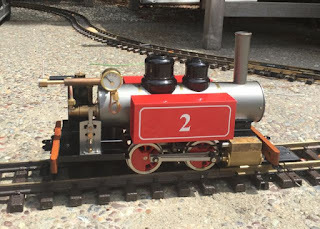 In anticipation of my grandson's visit, I thought it would be fun to add live steam to the collection of motive power for the garden railway. You can spend a lot of money on live steamers, but that wasn't what I was looking for. 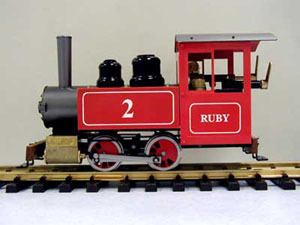 The Accucraft Ruby is a little 0-4-0, a "proper" steam engine with real valve gear, and affordable. I found one on eBay and a few days later, it showed up, very pretty in its bright red paint. It wasn't covered in oil, and didn't bear the scars of high-speed derailments, so I'd say it had never been run. I should start with an executive summary of the garden railway live steam experience. It doesn't last long, it's completely unpredictable. It is certain that you will get painful burns. It's fun, and my grandson loved it. It is absolutely not to be confused with running a railway, even a model one. First, though, there are supplies to be obtained. Distilled water and butane are available at True Value (the ubiquitous hardware store), no problem there. But steam oil (needed for the cylinder lubrication)... not so obvious. Probably any heavy oil would do, but to be safe I ordered some from Accucraft. Their minimum order is four half-pint bottles. The engine uses less than one cc per run. I have enough to last for about 500 years. Getting the engine running is pretty easy. Plenty of 3-in-1 oil on all the moving parts (no risk of over-lubrication here), fill the butane tank, top up the lubricator, and put 80cc of water in the boiler. This needs a tiny funnel to fit the ~5/16" (8mm) hole. Then put it on the track and light the burner. So far, no excitement. It takes about five minutes for the boiler pressure to reach the 30 psi working pressure, once I got the hang of setting the burner valve. Then the excitement begins. Before the engine will run, the cylinders have to be "primed". This means getting them hot enough that the steam doesn't condense, and the only way to do that is to pass steam through them until it stops condensing. The technique is simple, if spectacular. Put the engine into forward gear and push it along the track, turning the wheels. A fountain of near-boiling oily water shoots a couple of feet into the air, covering everything in the vicinity in a painfully hot shower. Never do this wearing clothes you care about! Once the water evaporates, the oil stains are permanent. Then you drag the loco backwards lightly, without turning the wheels, and repeat until the fountain of hot water is replaced by a jet of soggy steam. Now, you're ready to see some live steam action! The regulator (the valve that controls the flow of steam to the cylinders) rotates through about 180 degrees. But practically speaking, it has two settings: stopped and supersonic. There's maybe one degree of movement between them. Oh, and a substantial delay between opening and it and seeing the effect. Sooo... you open the regulator very slowly until, with a gentle push, Ruby just begins moving on her own. Very slowly she chuffs down the track. It's immensely satisfying. The instructions say she should never be run faster than a scale walking pace - say a few inches per second, and that's exactly what she is doing. Until she is just out of reach... when a steam-age miracle occurs and she switches to supersonic mode. Traveling at something like a scale hundred mph, she corners amazingly well on the four-foot radius curves of my main line, disappearing rapidly down the long straight parallel to the pool. But it can't last, and on the next curve or the one after she flies off the track, landing on her side. If you've managed to get this far without sustaining second-degree burns, you certainly will now. Steam, boiling water and burning butane are spewing in all directions, and everything you can touch is burning hot. Ignoring everything, she has to be picked up by her wooden buffer beams - the only part that won't deliver instant burns - and restored to the track. If she falls on her left-side, the butane valve has probably closed as well, since it sticks out to the left when open. This means opening the near-red-hot smokebox door (I still have the scar on my thumb) to relight the burner. Out of five runs, I did just once get her to tour the whole railway and keep going without ever derailing. She was still going way faster than the instructions say (I think they are just a tease), but she managed to stay on the track. She lasted for about five minutes before the butane tank emptied, puffing along slower and slower on her small reserve of steam. She has simple pin-and-link couplings, incompatible with any rolling stock I own. But it doesn't matter, because there really wouldn't be much point in giving her a train - it would just be more to fly off on the corners, and to rerail afterwards. She has little metal footsteps on each corner. I don't understand why, but just one of these bends every time she derails, so it fouls the track. And of course it's burning hot, and you can't get any purchase anywhere else to straighten it out. The solution was to remove it. Her pretty red paint is scratched and scraped on every corner, from her frequent derailments, and she is covered in a thin film of the oil that she sprays everywhere as she runs. So that was our live steam experience. Zac loved it, but now that he has returned home, I doubt that Ruby will be getting another outing for a while. It was fun while it lasted. And it has certainly removed any temptation to spring $2500 for a live steam scale model of a Shay.